It’s my favorite time of year for cooking, so I’ve gathered up my all-time favorite fall dinner recipes from the blog over the past several years. These are all super easy and delicious, full of fall ingredients and flavors, and perfect for autumn entertaining. I’ve linked all the individual recipes from our blog, as well as a short description of each dish for you to check out below! Let me know what your favorites are! 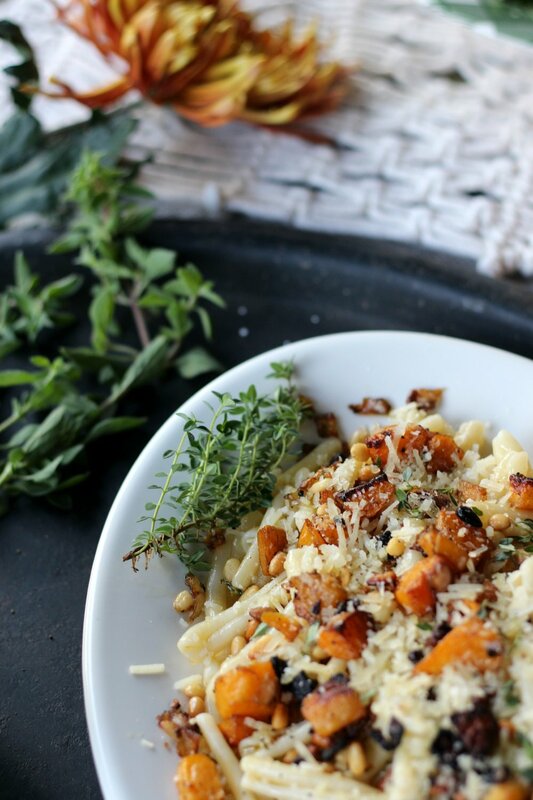 This recipe is for a super easy garlic butter pasta with fresh herbs that's topped with roasted butternut squash, onions, pine nuts, and Parmesan cheese. The simplicity of this dish really lets the flavors of the butternut squash shine and roasting the vegetables with the pine nuts gives the squash the deepest, smokiest flavor. I used casarecce pasta for this recipe which is becoming my favorite pasta to use (but you can really use any pasta for this). Find the full recipe here. This chili is no fuss and nothing fancy, but so hearty and delicious! My secret is using half ground pork and half ground beef for extra flavor. This chili has just the right amount of spice and seasoning without being too overpowering. You can serve with or without spaghetti and customize with your favorite toppings. Find the full list of ingredients and instructions here. We have been getting fresh butternut squash at the farmer's market every week for the past couple of months, so I'm always looking for new and unique ways to cook it so we can get our fill this fall. This pizza is also super simple to make and you can get ALL the ingredients at your local Trader Joe's. I especially prefer their ready-to-bake garlic and herb pizza dough, pesto sauce, and their already peeled and sliced butternut squash (a super easy shortcut for those who want to make this dinner even easier!). Find the full recipe here. The epitome of comfort food to me is a big bowl of potato soup with all the fixin's! It was one of our staple meals growing up and I still crave it all the time. I've tried a ton of recipes including crockpot versions, and over time I've combined my favorite parts of each with my mom's original recipe. I really don't like when potato soups are super thin and watery, and the reason I love this version so much is because it's extra thick, creamy, and has tons of flavor. It is so simple to make and requires hardly any prep work! Find the full recipe here. Mac and cheese is one of my favorite comfort foods and I love the idea of serving it in these gorgeous, bright roasted acorn squashes. I found this recipe on Pinterest from one of my favorite food blogs, Honestly Yum. I tweaked the steps in the original recipe just a little but kept most of the ingredients the same. The finished product turned out equally delicious and beautiful, a perfect dish for fall entertaining or to accompany your Thanksgiving dinner! Find the full recipe here. Topped with crumbled bacon, feta cheese, chives, and croutons, this is a perfect fall meal and is also delicious as a leftover.! I really enjoy the heat and depth of flavor the red pepper adds to the soup. Many butternut squash soups are very bland but this had tons of layers of flavor thanks to the smoky bacon and crisp red onion. Topping it with extra bacon and croutons adds a wonderful crunchy texture and the feta cheese adds a bit of tangy flavor. Find the full recipe here. Sweet potatoes on your tacos? I know it sounds crazy, but when I came across this recipe on Pinterest I knew I had to give it a shot. When September and October roll around, I'm ready to add all the fall vegetables and flavors to my dinners, like sweet potatoes, squash, and kale. 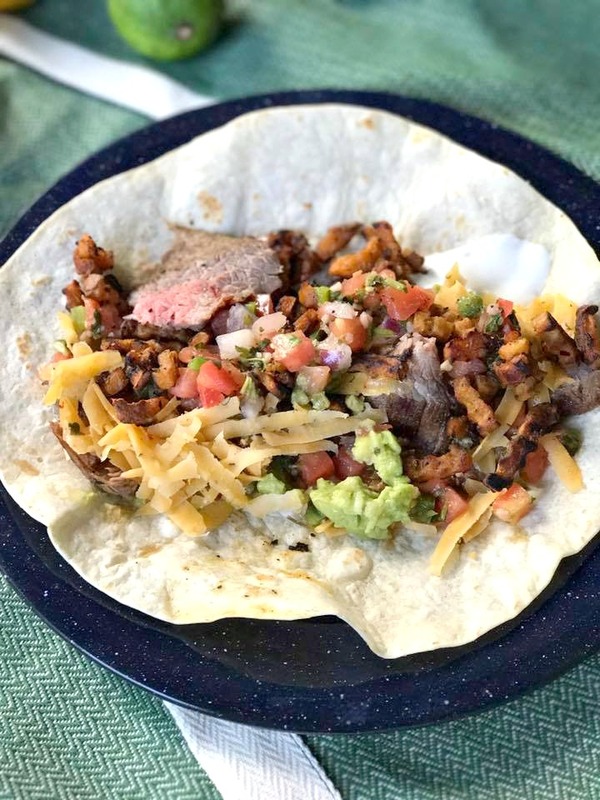 A well-cooked skirt steak is also a favorite of mine, and when it doubles as a taco topping- that's a win-win! The bit of sweetness paired with the zesty and slightly spicy skirt steak is just perfect! Find the full recipe here. Almost too cute to eat! These Halloween stuffed peppers are such a fun + easy recipe to make leading up to Halloween or for Halloween dinner. Each pepper is stuffed with black beans, ground beef, rice, and the taco toppings of your choice! I topped mine with pico, shredded cheese, and sour cream! Find the full recipe here. One of my favorite parts of this dish is the combination of all the bright and beautiful autumn colors on the plate! The balsamic adds just a touch of acidity, while the olive oil and garlic make all the vegetables taste perfectly buttery and smell so fragrant. I love the addition of the bacon because not only does it enhance all the flavors by cooking along with the vegetables, but it also adds a little crunch and texture combined with the pine nuts. All the flavors of the vegetables compliment each other perfectly, from the subtle sweetness of the butternut squash to the brightness of the zucchini. Find the full recipe here. There's nothing more comforting on a chilly evening than a delicious and hearty, hot soup for dinner. It's also such an easy dish to make and you can enjoy the leftovers all week! The hot sausage brings so much flavor to this soup but the potato and kale really balance it well and leave you with just the right amount of spice. I prefer a thicker soup so I only used 4 cups of chicken broth, but you can certainly add more until you reach your desired thickness. I love the extra texture that the hashbrown potatoes bring to the dish combined with the crispy sausage. Top it with your favorite freshly shredded cheese (I used Parmesan) and a side of crunchy bread for a seriously delicious and comforting meal that is also so healthy! Find the full recipe here.